In a few days time it will be 6 years since my mum passed on. I miss her so much. My last conversation with her was when she scolded me for not making ladwa for Diwali. Since then I make them every year without fail. This Diwali was a terrible time for me as the maid disappeared just before Diwali week began. Many people living in the western world think we are spoilt having help at home. However, take it from me its different in Kenya and India. Here because of the dust (we get this black powder like crinkle) we need to dust, sweep and mop every single day. When I’m at my son’s home in Montreal or at my dad’s home in London, we don’t need to do that every day. Washing machines and dryers are added help in the western world. I have a washing machine for clothes but not for my dishes. Also unlike in the west, most homes in India and Kenya have to prepare at least 2 hot meals if not 3. Anyway to top that I came down with a terrible flu accompanied by fever. However, still managed to make the ladwa. I know if I didn’t then the thought of what my mum said would haunt me till next Diwali. To prepare the dough, mix the semolina and wheat flour. Rub the 3 tbsps of hot ghee into the flour. Add milk and form a dough. Let the dough rest for 30 minutes. While the dough is resting roast the pista powder, almond powder, coconut, khus khus and sesame seeds separately over low heat in a wok or pan. Divide the dough into 6 parts. Roll each part into a ball. Press the ball in your fist to make a elongated shape. Heat oil over medium heat. Drop a tiny piece into the oil. It should come up immediately if the oil is ready. Drop the dough pieces into the hot oil. Lower the heat and fry the dough till they are golden brown. Make sure you turn them constantly so that they brown evenly. These are called muthias. Let the muthias become cold. Process them in a chopper or grinder. The ground muthias should resemble breadcrumbs. Grind the roasted sesame seeds coarsely. Add pista powder, almond powder, cardamom powder, nutmeg powder, saffron powder, sesame seed powder, khus khus and desiccated coconut to the ground muthia mixture. Mix it well. Take a wide pan or wok or karai and add the gur and ghee into it. Heat the gur and ghee mixture over low heat, stirring it constantly. The gur will melt and when it begins to bubble at the sides take the pan off the fire. Add the muthia mixture to the melted gur and mix well. Start making ladoos as soon as the mixture is cool enough to handle. Take about 2 heaped tablespoonfuls of the mixture and make it into a ball using your hand. Place the ball on the palm of one hand and with the other make it into a dome shape. Sprinkle khus khus over the laddoos or roll them in it. Or can leave them plain. Serve when they are cold and set completely. Don’t let the gur caramelise too much otherwise the ladoos will be hard. Work fast in making the ladoos as when the mixture becomes cold, it is difficult to form them into a ball. If you cannot make the dome shape, leave them round. If need be ask someone to help you. If you don’t get khus khus, you can omit it. I use one cup of grated or soft gur, but if you like the ladoos to be sweeter, add ¼ cup more. Use the more whiter variety of gur as opposed to the dark one. If you use the dark one, the laddoos will turn out very dark. After frying the muthias, break them into smaller pieces so that they cool down faster. If you find it difficult to shape the ladoos, add more ghee. 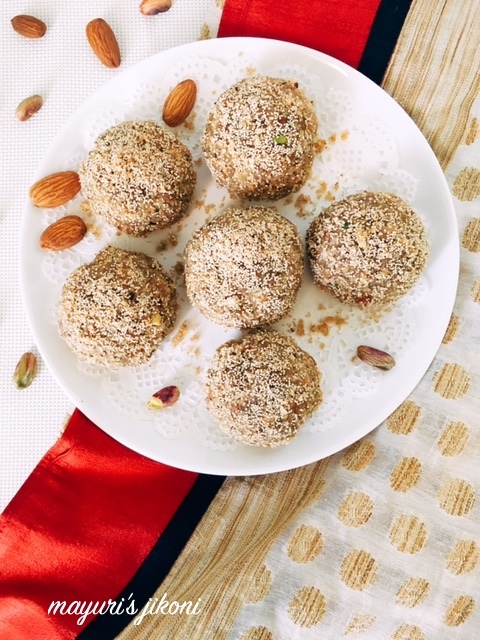 very healthy and delicious ladoos, thanks a lot Mayuri ji for linking it to the CWS event…. wow that is delicious and so healthy!!! Thanks for sending this yummy recipe to my event.. Looking for more yummy recipes…Please add the link of Pari's page also..
What a lovely post Mayuri. I'm sure your mom will be proud of you. Gur na ladwa look amazing. God Bless your mom and I hope you are feeling better . These ladoos are very delicious , typical Gujju ! Here these people make them with sugar and on Holi . Must try the jaggery version . Churma laddoos is one of my favourite since i tried them at home. And the new clicks rock Mayuri. I love churma ladoos, looks absolutely delicious. It is two years since my mother passed away and I still feel bad that I forgot to write down few recipes when she told me about it. The ladoo look great and love your new clicks. Very healthy laddus there and festive looking too.